The fictional place in a children's picture book has become a real life island in Nicaragua to impact poverty. Our 29-acre island, a bio-diversity hotspot in Nicaragua, will become a global, open-sourced, eco-learning paradise that will work to serve some 380,000 Multiethnic and Pluricultural people along the South Caribbean Autonomous Region (RACS). How a Children's book became an Island. 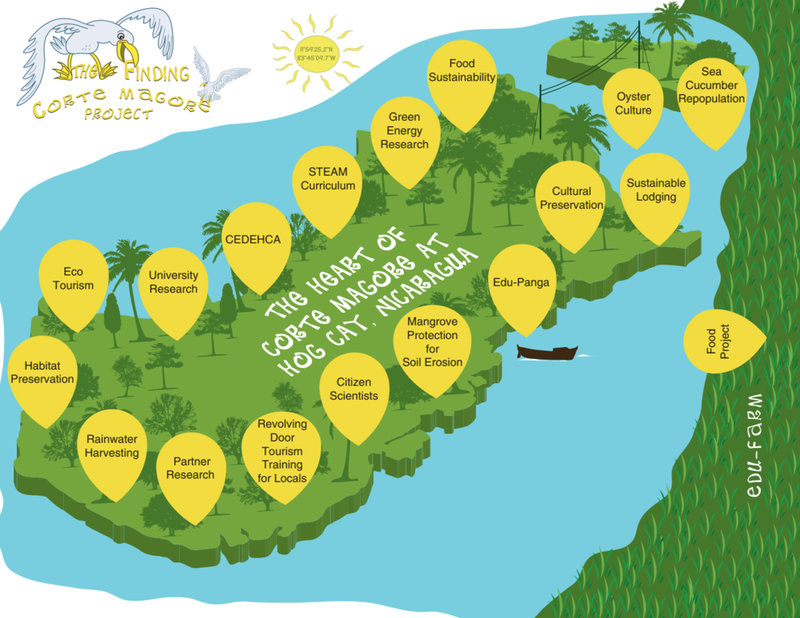 The Finding Corte Magore (FCM) mission is to set a precedent for sustainable development in this region of Nicaragua. We aim to create awareness and prevent the destruction of pristine natural habitats in which irresponsible and negligent tourism can adversely impact the impoverished coastal communities along the Atlantic/Caribbean. FCM will offer visitors the opportunity to engage in authentic cultural, experiential ecotourism activities. Participants will also have the opportunity to learn about environmental conservation as well as the ecological and cultural history of the area, while contributing to the social and educational development through projects and programs we put in place from the island. The FCM project is designed to be an educational hub and resource for the urban, rural, and indigenous Nicaraguan communities. Through content and curriculum development, we intend to engage and educate children everywhere about social good and environmentalism through a cross-cultural and collaborative approach to STEAM learning (Science, Technology, Engineering, Art and Math education). Through open-sourced content and engagement from researchers, scientists, students, universities, eco-tourists, and citizen scientists alike, we can all take part in initiatives spun from one 29-acre island, a unique bio-diversity hotspot that could benefit from human intervention. FCM is committed to worldwide sustainable development. Because of our commitment, we are creating the entire platform for an open-source project. This viable and repeatable business model can be applied to similar areas to create investable and scalable opportunities.